The Department of Natural Resources (DNR) has developed a proposal to construct a sturgeon rearing facility in Newaygo MI. 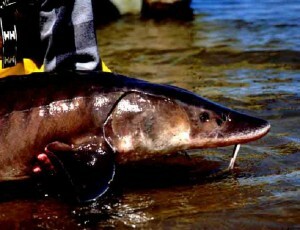 The purpose of this project is to assist the recovery of the Muskegon River Lake Sturgeon population. The rearing facility is anticipated to rear approximately 1500 sac fry and produce 600 fingerlings annually. The MRWA is partnering with the DNR in recruiting volunteers to provide on-site assistance (emergency on call, daily fish maintenance, egg and larva collection), education and public relations (lead tours, distribute flyers, fundraising) and facility maintenance. If you would like to volunteer and participate in this project, contact the MRWA.